When you think about needing in-home (Senior/Elder/Disabled Care, it can be overwhelming in the volume of providers and the sales pitches you will be bombarded with once you start making calls. Simply put, there are many agencies and types of providers out there. So why About Care Home Care? It's simple- We have been in business for over nine years in the Phoenix area. We only hire and provide the most experienced certified caregivers. Our model is one of experience. This means our caregivers who are going to be doing the care have the necessary and proven experience in all levels of Dementia, Alzheimer's, Hospice, Degenerative support care before we ever hire them, Disability & Surgery recovery care plus more. This goes far beyond hiring off the street and one week of training as many others do. You can't just state something on a website or create complicated programs to enhance an agencies profit margins while decreasing your bank account. We need to demonstrate it and by providing only independently certified caregivers or CNA's that have more than 1-year experience(most much more) you can rest assured that you are getting the type of care you need. Additionally, on-going training is provided. Our model is one that provides the best caregivers but at some of the lowest rates for employee caregivers! We are nurse owned with the availability of a fully licensed RN/BSN to guide us through any difficult cases and to keep us informed on trends and new processes. We live and operate in Arizona, so we understand the community, laws, and the needs of those who live in the Phoenix area with us. We have a thorough yet easy 4 step startup process that is one on one based and personalized to the care that is required. No two people are the same, but over time we have found many have the same requirements. Because we have over 40 combined years of care experience in our leadership team, we can & will understand your care needs. 1. The first thing we know is to LISTEN to everyone involved thoughts and needs/requirements and yes fears of bringing someone strange into your home! 2. Next, we work with you to ensure a thorough & proper CAREPLAN is completed and agreed upon by all. 3. The third is to MATCH the best caregiver to fit your needs- We can do this or you can choose. 4. Lastly, we complete the agreement(no contracts- you can stop service with 24hr notification) and payment paperwork(Most will have no deposit) - START CARE! We never do a pushy sales pitch. We provide information on what we can do for you or your loved one(s)! As we have always operated in Arizona, we know the unique Home Care needs of our state. We are about your care, not high-profit margins! We only hire multi-year experienced certified caregivers. We never charge for weekend rates, mileage, geographic surcharge, extra for personal care and much more! At About Care Home Care our rates are fixed & published. We strive to keep prices as low as we can by not inventing extravagant programs to justify higher rates or pay for expensive TV or print ads. We also pay our caregivers a higher percentage of your fees than most other Home Care agencies in the valley. 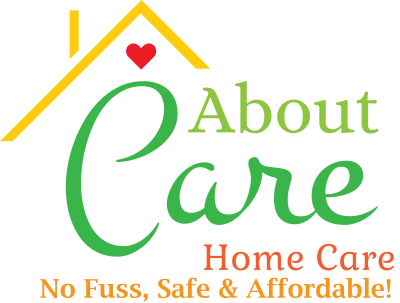 Ways Home Care can save you money over other types of care! Savings on high-cost emergency room visits. The high cost of assisted living when paired with one on one personal care or all of the extras many charges. Alleviate multiple wellness trips to see how mom & dad are doing. Our caregivers can fulfill services such as shopping and transportation that others charge a premium for. Pay or Long Term Care Insurance are the primary methods to pay for Home Care services. We also accept all major credit cards & checks. Reverse Mortgages, Life Insurance, and other asset dissolution methods. For veterans who need long-term help with the activities of daily living, The Veterans Administration will, in some instances, help by providing financial benefits and incentives. Veterans must have had an honorable discharge and must have also served at least 90 days of active duty during a wartime period. In addition, spouses of veterans may also be entitled to "aid and attendance," a monthly disability payment program established by the VA, that may provide some assistance in paying for in-home personal care services. If you have questions about what your financial options are for affording personal home care services, give us a call. We have partnered with a great company to get your care from the VA in weeks not months(if qualified).